Congratulations to our 2019 SSF Valentine's Day Giveaway Winners! The winners are Sandy, Sabrina and Marianella. The Foundation has privately emailed the three winners. Thank you to everyone who supported the SSF by participating in our giveaway! To celebrate the season of love, the SSF is holding our annual Valentine's Day giveaway to Sjö how much we appreciate you! 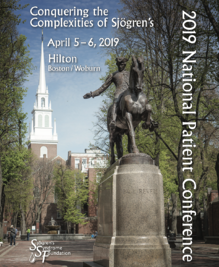 Read below to learn how to enter and win one of three complimentary registrations to the 2019 SSF National Patient Conference! To enter, all you have to do is comment "Happy Valentine's Day" below by 11:59pm EST today- February 14, 2019. The Foundation will privately email the three winners on Tuesday, March 5, 2019. Winners will be picked at random and the registrations are only transferable through family members, which means your family members may also comment and enter can comment below to give you an extra chance at winning! Please email us at info@sjogrens.org with any questions.